The art deco Golden Gate Bridge remains a marvel more than 60 years after its construction. More than just the singular icon of San Francisco, the "Gate Bridge," as it's known by locals, is a constant and enduring symbol of grace in the Industrial Age. 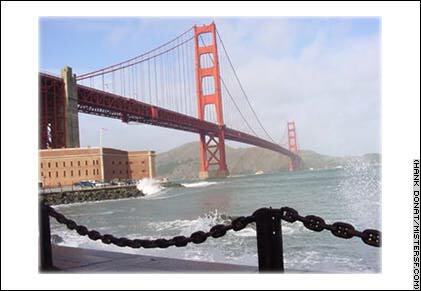 For a great outing with breath taking views, you must walk the entire span to Marin County and back. There's no feeling quite like crossing over the magnificent gateway to the Pacific on your own steam. Detail V: Walk across the Golden Gate Bridge!